Techland and inXile Entertainment have announced that Torment: Tides of Numenera wil launch on PC and consoles on February 28. The publisher also shared details about the content of the Collector's Edtion and Day One edition. Plus the introduction video of the third class, Jack. Wroclaw, Poland – December 14, 2016 – inXile Entertainment and Techland Publishing have announced the release date for Torment: Tides of Numenera - February 28, 2017. The highly anticipated and massively crowdfunded RPG will be released for PC, PlayStation 4 and Xbox One. Pre-orders for the Day One Edition and the Collector's Edition are now available. For a full list of what is contained in the Collector's Edition along with pre-order incentives, see the official trailer. Torment: Tides of Numenera is set one billion years in the future using the science-fantasy setting created by pen and paper RPG luminary, Monty Cook. Players will experience a game of intricate choices and consequences with thousands of meaningful decisions that will make every playthrough unique. The game is created and developed by inXile Entertainment, which consists of industry icon Brian Fargo and many other veteran creators of the original Planescape: Torment - one of the most critically revered CRPGs in gaming history. 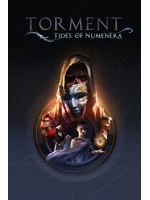 For more info on Torment: Tides of Numenera and the various editions available, check out the tormentgame.com website. Torment: Tides of Numenera will be available on PC, PlayStation 4 and Xbox One.